Officials from Middle Georgia State and Macon-Bibb County announced October 22 that they have signed a lease agreement to permit the University to expand its fixed-wing flight and airport management instruction to Macon. The University will expand its flight instruction, which is now offered only in Eastman. Middle Georgia State will offer courses in flight training, ground school and fixed-base operations in newly renovated facilities at the airport, located in east Bibb County. The Macon-Bibb County Industrial Authority will lease the facilities – including classrooms and hangar space – to the University for up to eight years. The University also agreed to manage a fixed-base operation and fuel farm at the airport. In expanding the flight instruction, Middle Georgia State anticipates attracting additional students from the Middle Georgia and Atlanta areas who seek the flight instruction offered by the state’s only public higher education aviation program. The Macon/Bibb operations will be a satellite learning facility, building on the strong foundation of the School of Aviation on the Eastman Campus. Expanding to the Macon/Bibb area is in line with the University’s statewide aviation mission and the School of Aviation’s strategic plan. 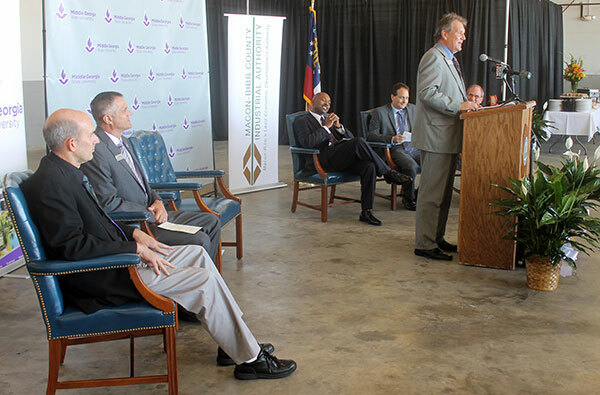 Cliffard Whitby, chairman of the Macon-Bibb County Industrial Authority, said, “The economic growth of our community comes in many forms, and the Industrial Authority is proud to partner with Macon-Bibb County and the University in such an innovative project. The University will start accepting qualified students immediately, while classes will begin in January 2016. Initially, aircraft based in Eastman will be used for the training in Macon. Additional employees and aircraft purchases are anticipated as the program grows. Growth of the School of Aviation is forecast in its strategic plan, which was submitted to the University System of Georgia Board of Regents in July. The plan provides a multi-year approach to review and adjust existing aerospace and aviation academic programs in Georgia and establish other satellite learning locations through statewide expansion. Opening the Macon flight training center is one of the first moves in that expansion plan. The University is leasing 5,100 square feet of classroom and office space on the first floor of the airport’s main building, plus 6,100 square feet of hangar space. The Industrial Authority has remodeled the building and also will install a new heating system and lights, among other improvements. The University’s rent will be $500 per month the first year; $1,000 per month the second year and $2,000 a month each year thereafter and a fuel flowage fee. Middle Georgia State’s costs will be offset by student education fees and general funds, plus funds from fuel sales. The School of Aviation’s strategic plan envisions additional expansion in the years to come, including flight instruction in the Atlanta area, as well as new flight operations in Valdosta, Columbus, Savannah and Camden County. Additional aircraft, facilities and staff would be needed as the programs develop. The plan seeks to address the needs of the aerospace industry in Georgia, including demand for pilots, operations management and maintenance personnel. The Eastman Campus would serve as the hub for the University’s developing satellite operations. Middle Georgia State offers a four-year degree in aviation science and management, as well as certificate programs in airplane and helicopter flight training. Students can pursue those courses at the Eastman Campus, or many of the courses are available online. Associate's degrees and certificates in Aircraft Structural Technology and Aviation Maintenance Technology are also offered on the Eastman Campus. Prospective students interested in flight training in Macon can contact Adon Clark, interim dean of the School of Aviation, at (478) 374-6980 or adon.clark@mga.edu. Photo: Dr. Christopher Blake, MGA president, announces the flight training expansion program at the Downtown Macon Airport.